Highest quality access hire from just £41.60+VAT per week. We receive amazing customer feedback regularly. PASMA trained staff to help you hire exactly the right equipment for the job. Guaranteed next day delivery or your money back! Leeds boasts a thriving busy construction industry including the development of not just stores and offices, but also flats, family homes and city centre apartments. Those involved in the redevelopment of the town know that the success of their building projects, regardless of size, depends on cost, efficiency and safety. 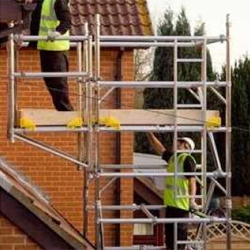 From professionals on big construction sites to property-owners doing small jobs around the home, nothing provides more flexibility, versatility and safety than a mobile scaffold tower. By hiring an access tower, you can complete tasks at a wide range of heights and locations with peace of mind and absolute safety. Our professionals offer guaranteed next-day delivery of an access tower anywhere in the Leeds area, at the most competitive prices in the industry and hiring a mobile scaffold tower is so easy – all you need to do is make one quick phone call. Ring us today and your mobile scaffold tower will be on site ready for action tomorrow. We even pressure wash, inspect and check our scaffold towers after every use so you know that your equipment is in excellent condition. For efficiency and safety, it’s essential to have the best equipment for the job. Our professional experts are on hand to help and advise. They have safe, quick and easy solutions, and can provide specialist kit in any situation, from a major building project to simply cleaning your gutters. 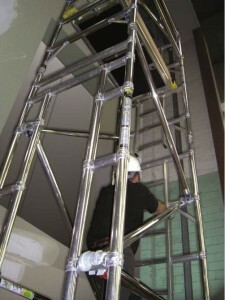 However high you want to work, hiring a scaffold tower has never been easier. 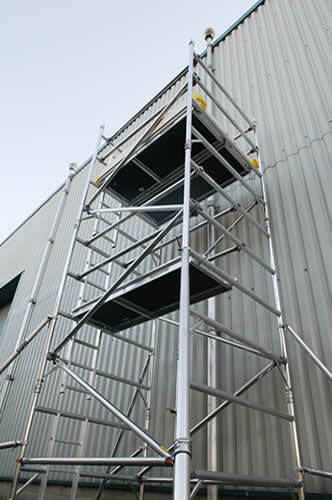 We have a wide variety of scaffold towers at really affordable prices. They come with a basic user guide and are suitable for most domestic and commercial projects. For the first-time user, erecting an access tower should take no more than 30 to 60 minutes, and no special tools or experience are needed. We can offer lightweight aluminium access towers which are mobile, adjustable, and easy to transport and manoeuvre even in tight spots. It means that if you are working across a large area, your mobile scaffold tower will be easy to adjust and move into position. Falls are the biggest cause of death and injury in Britain’s construction industry, so it doesn’t make sense to take risks. If you’ve got a job to do, and it’s out of reach, the answer is only a phone call away. We have all the scaffold towers, and all the answers. Whatever your project in Leeds, big or small, our mobile scaffold towers and other specialist kit are the best you can get.